Amazon previously offered two different ways to give Informed.co access to your marketplaces. Previously, most sellers used their own secret key and access key which was the only way to add a developer before Amazon implemented a stricter system for providing developers authorized access to your account. When developers access an account using a secret key and access key, you will not see them listed as authorized developers when looking at the permissions page in Amazon. IMPORTANT: Amazon has now required that sellers move away from this authentication for stability and security, because of this Informed.co is also requiring all customers to switch their marketplaces over to an authentication token authorization. Please read the below directions to update your access in Informed by January 31st, 2019. To add Informed as an authorized developer with access to your Seller Central account, choose from one of the links below depending on which marketplace you would like to add. IMPORTANT: You will not need to delete any marketplaces to make this update. Deleting your marketplace will result in your listing data being lost. If you are encountering an issue when entering your MWS Auth Token please contact our technical support team. Note: You will only need to do this one time for each regional platform (North America/Europe) you sell on. For example, if you sell on Amazon US, CA, and MX, the same auth token you get after registering one marketplace will be used for all 3 marketplaces. Select “I want to use an application to access my Amazon seller account with MWS” or you may need to first select "Visit Manage Your Apps"
Once you’ve given Informed.co permission to access your Amazon Seller Account and agreed to the Terms of Service, you will be brought to a confirmation page. 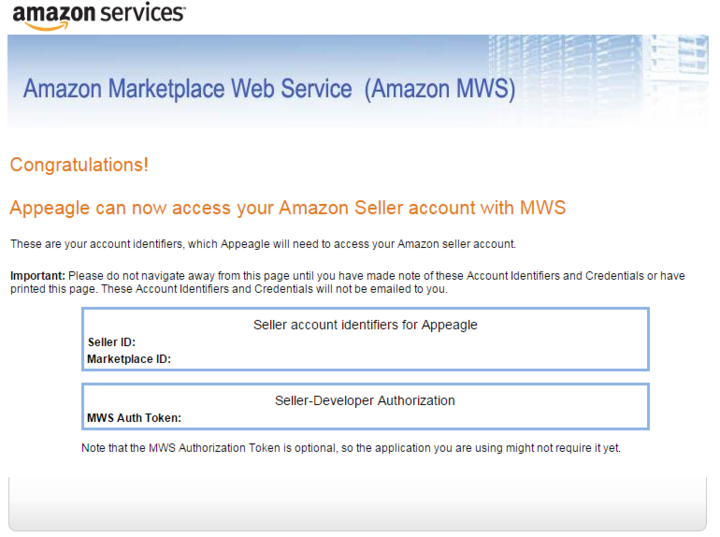 After obtaining this key, please head over to your Marketplaces page and input your MWS Auth Token in the specified field for any marketplaces that are still using an Access Key and Secret Key. The below image is an example of an account still using an Access Key and Secret Key that must be updated by entering in an MWS Auth Token and selecting "Save". Keep in mind, you do not need to remove your Secret Key and Access Key, this will be done so automatically on January 31st, 2019. IMPORTANT: Any marketplaces that are not updated by January 31st, 2019 will be automatically deactivated.